Peter made the rum punch while Hilary showed us round Nisida. While we inspected our quarters, Peter mixed the carefully measured proportions - one of sour, 2 of sweet, 3 of strong, 4 of weak. A delicious welcome to the Caribbean, the first of many similar concoctions we were to drink during our trip. 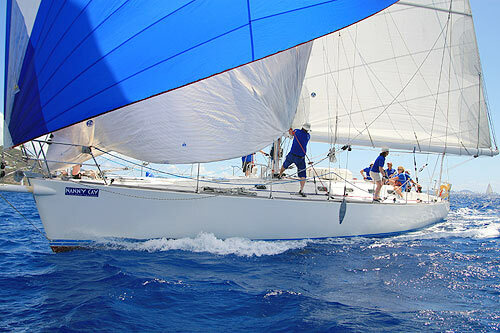 We'd come to race in the British Virgin Islands regatta, but most of the crew had decided to join the boat in Antigua for the delivery trip up to BVI, and sail back to Antigua again. That way, we would get more sailing, see more of the Caribbean and extend the trip to two weeks. The next day, after some work preparing the boat, we set off to look around English Harbour. The restored buildings in this old naval base, where Nelson served, now house a hotel, a museum and bars and restaurants. We of course ordered a rum punch to savour in this idyllic spot. What a disappointment - it tasted like orange squash, in fact that only unenjoyable punch of the whole trip. Before setting off for BVI the following afternoon, we provisioned the boat at the local grocery store. This was entertaining but challenging as Antiguan products were unfamiliar, and many were in unmarked packs with no prices. A helpful expat American customer offered some guidance, recommending some dodgy looking but delicious green oranges and excellent marmalade made by Gladys "who lives just up the road". With trade winds invariably blowing in the same direction, it was safe to predict that the passage up to BVI would be a run. As the sun set, we enjoyed Hilary's delicious spicy chicken and rice, and sailed past the rather spooky island of Montserrat, with its live volcano, permanently covered in cloud. It was a balmy night, and even felt warm during our night watch. We arrived in Sopers Hole on Tortola the following afternoon. This little harbour is far more attractive than it sounds, with shops and restaurants in buildings painted in various pastel colours. The speciality cocktail of Pussers bar was the "Painkiller" - a sort of pina colada version of rum punch. It came served in branded enamel mugs, which of course all the crew bought as souvenirs. "Let's get the spinnaker up on deck" said Peter the next morning - reminding us that we would soon be racing. The trip from Sopers Hole to Nanny Cay, to be our base for the regatta, provided an opportunity to hoist the spinnaker and practise some manoeuvres. Nanny Cay, also on Tortola, was delightful - we quickly discovered the swimming pool, the little beach, and the fancy showers. Definitely the most luxurious marina showers ever - spacious, with designer fittings and beautiful curved wooden doors. After a cooling swim in the pool, that evening we all somehow found the way to the stall where Mount Gay Rum, a sponsor of the regatta, was selling extremely strong rum punch very cheaply. Oh dear! Thanks Judy, for helping me upstairs to the restaurant for dinner and for ordering me a rum-absorbing meal. Luckily no hangover this morning, as we were to race from Tortola up to the Bitter End yacht club on Virgin Gorda island. We were in a "performance cruising" class, i.e. with spinnaker, but separate from the serious racing boats. It was a cloudy morning and just as we got settled on the rail, it started to rain - so on went the rain jackets. But it was warm enough just for shorts, and as no one thought to re-apply suncream in the clouds and rain, there were lots of burned and pink legs by the end of the race - ouch! The Bitter End, in fact a hotel, was in an idyllic location that looked just like a picture from a Caribbean holiday brochure. And we had time after the racing to enjoy it, relaxing on sunbeds on the beach and swimming in the sea. But their so-called English pub served the most expensive rum punch of the whole trip. But no matter, the pub had a darts board, so we had the serious business of a crew darts match to distract us. Half the crew were left handed (amazingly), so it was left-handers versus right-handers, or something like that. 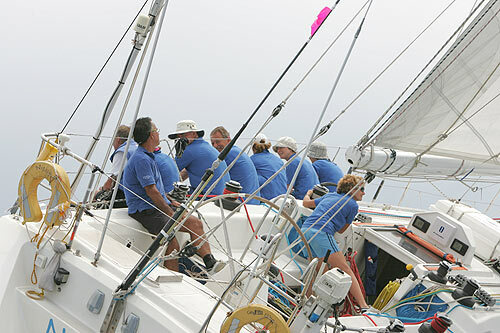 The next day was supposed to be a lay day, but the option of a race round Virgin Gorda proved too tempting. And we did come 3rd in a fleet of 11! And the next day we raced back to Nanny Cay. Many more boats had arrived in Nanny Cay in the meantime to take part in the following three days of round the "cans" racing. The "cans" were in fact mainly small islands with names like "Dead Chest", Salt Island and Frenchman's Cay, reminders of the BVI's buccaneering past. This was more intensive racing, with two races each day. But of course we still managed to pose elegantly on the rail for the photographers who, paparazzi-style, aimed their long lenses at us as they balanced precariously in their little RIBs. And we were pleased to come 4th over the five races. With the additional crews, the queue for the posh showers each evening got very long. But it was a friendly queue and we quickly got chatting to sailors from other boats. How else would we have got to meet the uncle of LCSC member Mel Haslam? It's a small world! A row of stalls had been set up, selling drinks and different types of local food and international food. Over the three evenings there was a chance to try different dishes - goat curry with rice and beans, rotis, and conch soup among them. The bar staff (volunteers from the sailing club?) willingly put as much or as little rum with the punch mixture as you wanted, as some of the crew (Malcolm!) discovered to their cost. Then it was time to set off for the passage back to Antigua. More of Hilary's delicious food on deck as the sun set, another balmy night. As we came up on deck for our night watch, we were introduced to a new crew member, Fred. Fred was a short piece of rope lashed to the wheel, a low-tech but very good autohelm. As our watch passed uneventfully, we had time to ponder what FRED's full name might be - Finely Regulating Easy Driver perhaps? We arrived back in Antigua in the early evening and dropped anchor for the final night outside Jolly Harbour. Time for a final rum punch and convivial meal, and then a final swim in the Caribbean.